Things have been a little crazy these days. foodgawker is growing each month and is keeping me really busy. To add to the insanity, I launched craftgawker last week. It's identical to foodgawker, but focused on arts and crafts. So that's the reason why it's been quiet around here. But then I got slapped on the hand by BlogHer (our ad provider) for not posting in over a week. I felt like a kid in high school who got in trouble and is being sent to the principle's office. BlogHer's "reprimand" is actually a good thing, otherwise I would have neglected SND even longer. We were planning on posting about an 11 layer lasagna that's relatively easy to make, but the Daring Bakers' challenge this month was lasagne. As you've probably seen, the food blogosphere has been inundated with DB pasta. 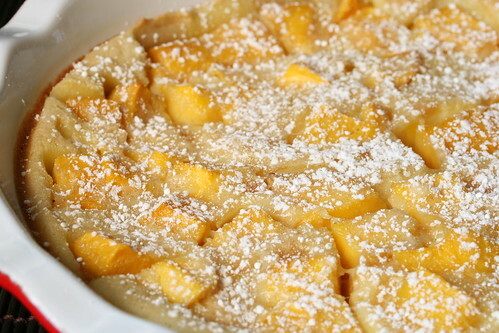 Instead, we present to you a mango and coconut flognarde that Hungry Bear saw on flagrantedelicia. We always enjoy looking at the beautiful photography and desserts on Leonor's site. We were supposed to make this flognarde for Sunday nite dinner last week, but ran out of energy to make dessert (we had a pre-dinner yoga session with a one of the SNDsters). A friend brought over ice cream cookie sandwiches from Trader Joe's instead. They were super delicious and a dangerous new TJ find. Hungry Bear and I love bamboo shoots, but we've never cooked with fresh ones until recently. During the winter time, we always see fresh bamboo shoots in our local Asian markets, but hesitated to buy them until a few months ago. Neither one of us knew how to peel them, so we searched the Internets and discovered it was relatively easy to prep bamboo shoots. Here's an informative video that shows how they are found and prepared. 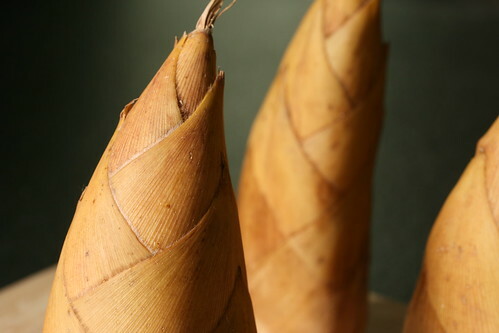 The bamboo shoots in the video are boiled to remove their bitterness. We're not sure why it is necessary because the shoots we get are not bitter, so we simply peel them following these steps. 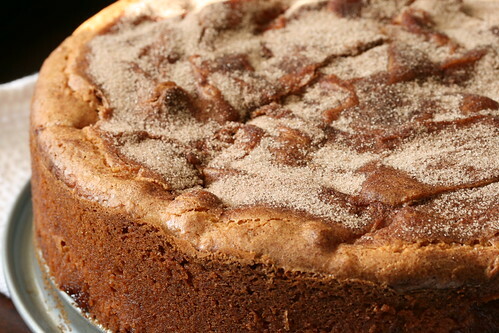 A few months ago, Hungry Bear favorited this cinnamon-apple cake on foodgawker and she finally made it for our Lunar New Year celebration this year. It's not Chinese or Vietnamese in any way, but Hungry Bear didn't want to make anything too elaborate and we had two apples to use up. So that's how a cinnamon-apple cake got served at a New Year's party with Chinese hot pot. I was working that day when Hungry Bear was baking the cake and I wasn't paying much attention. She told me that it was a Cooking Light recipe, but she was making it full-fat because she hates margarine and fat-free cream cheese. I honestly wasn't very excited about the cake. I don't get too excited unless there's chocolate involved. Last year, we attended a Chef Panel Discussion event presented by the Asian Culinary Forum (Andrea Nguyen is one of co-founders). The panelists included Charles Phan (Slanted Door), Eric Gower (The Breakaway Cook) and a several other respected Bay Area chefs. Hungry Bear and I were really impressed with Eric. He was by far the most entertaining and passionate person on the panel. 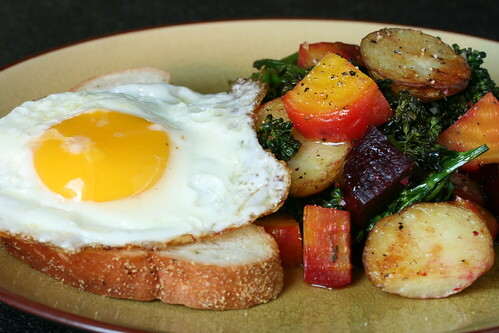 Through his commentary, Eric sold us on his "breakaway" cooking style. The simplicity of his cooking really resonated with us. 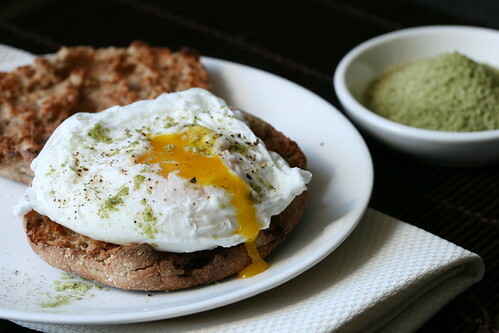 The ultimate clincher was the way he enthusiastically described his poached eggs with matcha salt.